The great brain simulator strikes again! I don’t know why I hadn’t thought of it but there must be an open source idea was what I woke up thinking this morning. The night before I’d been chewing over the fact we were streaming two or three hangouts from the same place so the upload bandwidth is going to compromise the size of video we want to stream. At the moment I’m happy streaming 1080 x 720 which is good enough for all handheld devices which when you multiply it by three it’s a fair old difference that could reduce the quality of our broadcasts or we reduce to 720 x 576 and might still be ok on handheld devices. But I’d like to think 1080 x 720 is possible ans so should be the minimum we aim for, not full HD but HD. I did a speed test on the network to calibrate how much we could upload and the network through the router, though capable, didn’t leave me feeling we are gonna be way all right and so I tested the 4G connection on my phone tethered to my laptop. 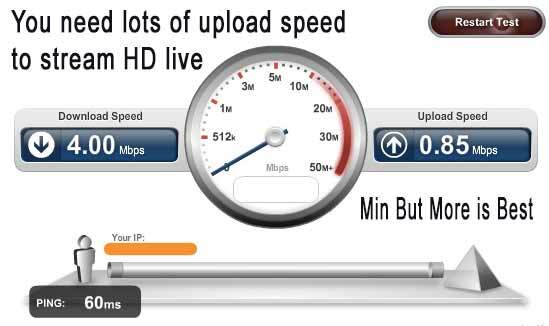 Upload speed of 18 megs per second which was exactly the same as the download speed and is eight times more than my broadbands upload speed at home. 4G, providing you have a good signal has proved to me to be well capable of streaming shows and is fantastic news for when we’re up on the Royal Mile streaming the street acts during August at the Fringe, being the Fringe of the Fringe. Well, we’re constrained to what we have and what’s in our pocket on any given day and the solutions I’d been looking at where software that would handle all the camera work before it streams to YouTube effectively reducing three hangouts to one hangout with more bandwidth and stream 1080 x 720 fairly comfortably. Wirecast and such are brilliant for producing a show to then stream live but they come with a cost for more than one camera so it wasn’t something we could consider. Even capture cards would add a cost that is outside our constraints and is definitely something that will happen next year. It will be our growth, standing on what we do this year. And I’d looked into software and hardware that was going to cost money and had a look at Open Source but what I found at the time would’t do what we were hoping to achieve. 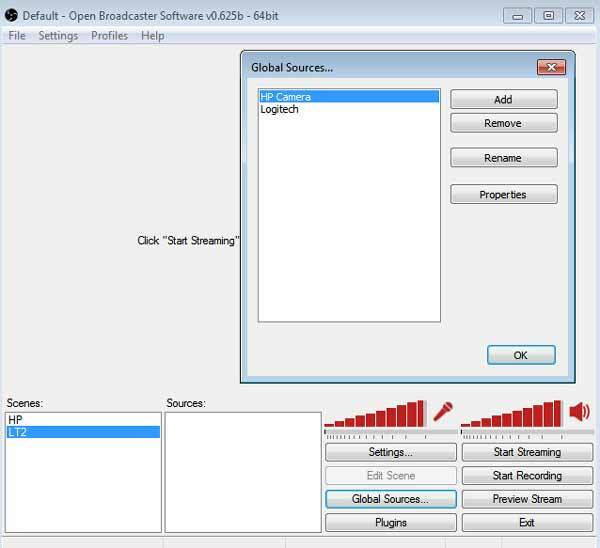 So I woke up this morning and had another search and found Open Broadcasting Software which would easily line up cameras, video, images, slide shows everything you need to line up a show and stream it straight to YouTube. I was using it within minutes. In it’s simplicity it was easy to get to grips with, and a tip I discovered was to load your cameras in as a global Resource and then add them to your scenes. One limitation was that I couldn’t use two cameras that were the same make but if you use cameras of different makes, each with their own drivers the OBS will pick up all your cameras, and so the angles of the shots that will go into the broadcast. Fortunately I’ve got a Logitech and an HP so if I get another make then theoretically I’d have three cameras to choose from for the shot. To extend the cameras lead, which is about a meter, we’re using 10m USB leads with signal strengtheners which you can daisy chain into longer lengths and ensure your camera signal get’s to your laptop or PC. So we have the rudimentary makings of a show where we can get angles on the band all before it streams, saving bandwidth and ensuring we can stream at 1080 x 720. Problem solved till it’ll be all right on the night! And all from thinking to find solutions.